Now that the first photo of Christina Ricci as Lizzie Borden has been released, you will want to read about the legendary crime for yourself. 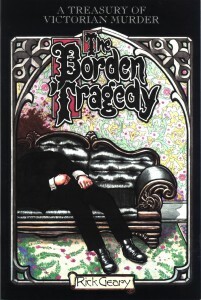 The final days of Graphic Novels Month is an opportune time to delve into The Borden Tragedy: A Memoir of the Infamous Double Murder. The 21st Century has no monopoly on sensationalized true crime stories, and this volume of the Victorian Murder series illustrates the facts and questions as they are known. The heavy black frames and recurring use of patterned lines add to both the ominous tone and the historic feel. We may never know for certain who got away with murder that fateful day, but Rick Geary presents the case with startling clarity.